The color alone is worthy of a Spanish fiesta. One of the first few dishes I learned to cook was Arroz a’la Valenciana. I inherited this recipe from my mom, so this may be different from the restaurant version or the true Spanish version, both of which I have never tried. I can only guess that this recipe travelled to the Philippines during the 300 year Spanish occupation of my home country from 1621 to 1898, through an expedition led by conquistador Fernando Magallanes or Ferdinand Magellan as he is more commonly known. Along with their recipes, they brought Catholicism, a new government, and every other repercussion that comes along with conquering another country, including its name. The Philippines is so named because of King Philip (or Felipe) of Spain, who was Spain’s ruler when Magellan first landed on the island. 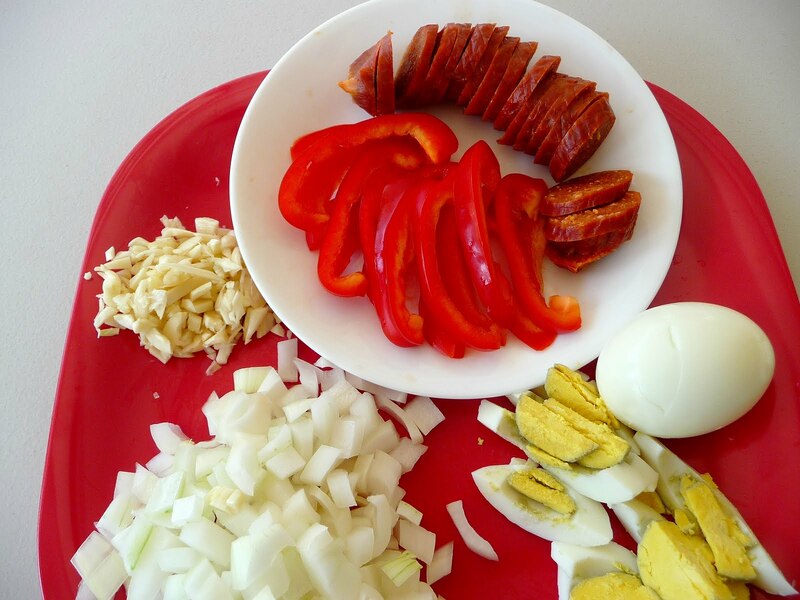 Main ingredients from top left: garlic, red bell pepper, chorizo de Bilbao, hardboiled eggs, onions. 1. Cook the rice in advance. I used Calrose for this recipe but long grain is fine. You can combine the long grain with sticky rice by using 2 cups long grain and 1 cup sticky rice. 2. Hardboil the eggs. Set aside and let cool. 3. Heat up the olive oil in a big pan or wok on medium heat. Saute the garlic for about 20 seconds, add the onion and cook until glassy. Add the chicken and tomato sauce and cover the pan. Bring down the flame to, low to medium. Simmer for about 15 minutes. Stir everything around to cook the chicken evenly. Add the chorizo. Cover the pan and simmer for 10 minutes. Add the bell peppers and salt to taste. Cover the pan and simmer for another 5 minutes or until the chicken is cooked. 4. Separate the chicken from the sauce. Pour the sauce into a heat resistant container. Add the rice to the pan a little at a time, alternately with the sauce until evenly coated. 5. Microwave the green peas for about 20 seconds or until thawed. 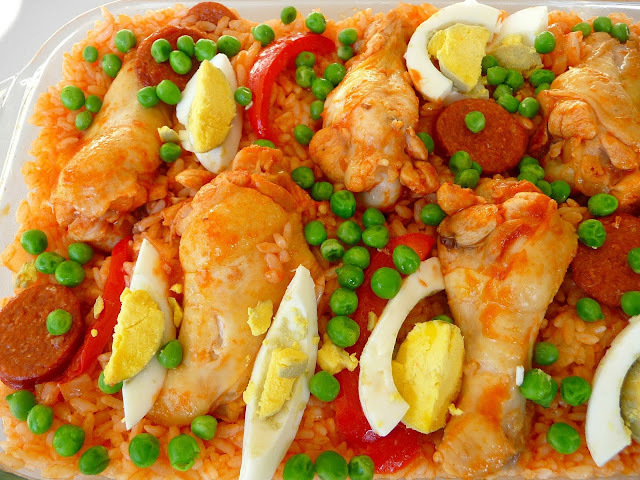 Arrange the rice and chicken by layering them on a serving dish. 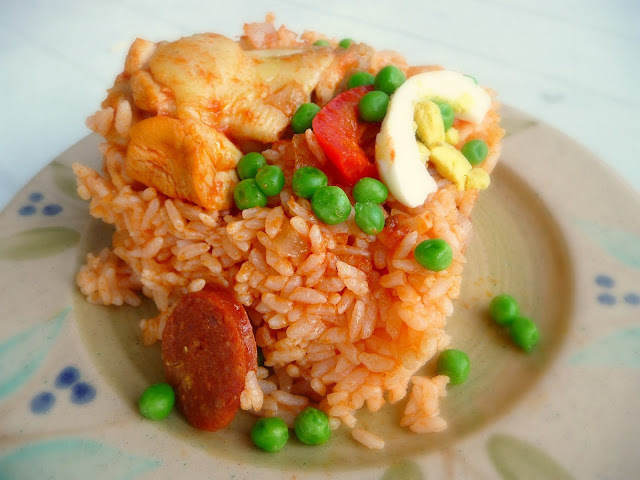 Garnish with hard boiled eggs and green peas. Serve immediately. *Chorizo de Bilbao is different from Mexican chorizo. Please do not substitute. Marca El Rey used to be available in a 2-pack shrink wrap in most Filipino stores, but now they are only available in 4 lb. cans. My friend bought one can and gave me a few chorizos. Oddly enough, she found the chorizo at a Japanese market. Thank you. Try it and let me know how it turns out.